The Vermillion Area Chamber and Development Company (VCDC) is working on three ways to retain University of South Dakota students in Vermillion after graduation. With the addition of Eagle Creek Software Services, residential property Bliss Pointe and the Prentis Park master plan, the VCDC and Vermillion City Council are making improvements to make Vermillion an attractive location to continue their lives. The keys to the Vermillion Technology Center will be handed over to Eagle Creek in June 2014. Work continues on the $5 million building owned by the VCDC. Eagle Creek will lease the entire building. The layout features open office spaces to allow flexibility for the tenant. Eagle Creek believes in a collaborative environment, so the building will have an open layout with large windows, said Joanne Ustad, resource developer at Eagle Creek. “Eagle Creek is a team environment,” Ustad said. The building features two self-sufficient wings. The wings can be sealed off if Eagle Creek does not need the additional space or decides to leave Vermillion. Each wing contains bathrooms, offices and three pods. Each pod contains a conference room, office and space for cubicles. The interior will also feature a break room with a gaming area for pastimes such as foosball or a pool table. The exterior of the building will feature large windows and a design, which slightly reflects the Lee Medical building on USD’s campus. Howe said the VCDC wanted to bring some of the architectural features from USD off-campus. Howe said the building’s timeline and budget are on track. “We’re taking a huge risk that this company is going to be here and be strong, but we believe in them. 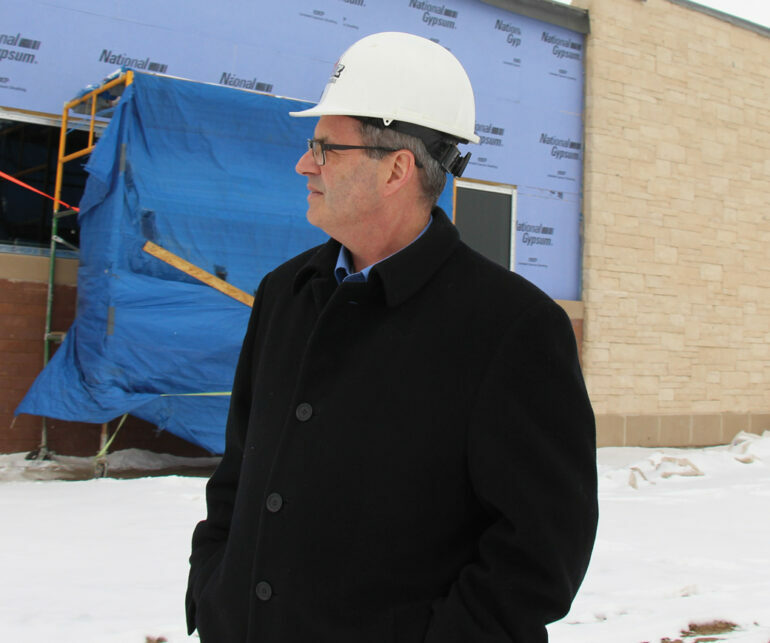 That’s the message, though…we’re making things happen here in Vermillion,” Howe said. Eagle Creek is an information technology company based in Minneapolis, Minn. IT consultants will work on projects involving customer relationship management, business intelligence, big data and mobile application development. The company hopes to recruit from students in the newly launched IT Consultant Academy at the University of South Dakota. Students have the opportunity to take courses paid for by Eagle Creek, an internship and possible employment with the company. Students have to apply for the program with Continuing and Distance Education. The academy will offer Project Management for Business Consulting and Software Engineering for IT Consulting in the fall semester. Ustad said another training course begins March 25 to have a larger staff move into the Vermillion Technology Center when it opens. The VCDC owns an office park located across from Walmart where the Eagle Creek building is being constructed. Howe said the VCDC is looking for companies to build office space on the property. The VCDC also owns residential property west of USD called Bliss Pointe. The new residential development will be ready for development by August. The VCDC will install streets, water and sewage to make the lots developable. The development is located near Valiant Vineyards Winery and overlooks the bluffs. It was designed with both higher end and less expensive housing in mind, Howe said. In Monday’s city council meeting, city manager John Prescott said the streets in the development will be named after famous artists. In 2012, the city of Vermillion conducted a talent attraction survey and workforce housing survey. One of the ideas from the survey was to more fully develop the art and cultural significance of Vermillion, Prescott said. “We thought we had a unique opportunity with Bliss Pointe after famous artists, painters and writers of our era. We selected 21st century artist who had relatively simple names to spell and fit on a street sign,” Prescott said. The street names will be: Rockwell Trail, O’Keeffe Circle, Joplin Street, Frost Trail and Wilder Road. The City Council adopted a master plan to redesign Prentis Park in January. The plan entails a new aquatic facility and relocation of park amenities to provide a better use of space and more parking. The pool concept includes a lap pool, zero depth area, water slides and a lazy river. The plan also entails new basketball and sand volleyball courts. A restoration of the amphitheater and sidewalks is also planned. The downtown Vermillion district is also doing well according to Howe. Two banks in the downtown area are remodeling their storefronts. Howe said both Cafe Brule and Red’s Steakhouse have recently remodeled as well. “We are attracting the right types of businesses that will keep students in the community and get people to move the community,” Howe said.